Light and privacy control in one compact design. Ares Blinds look similar to Roman Blinds, yet they add softness when open because of the sheer fabric that they are made from. Unlike a Roman Blind you do not need to completely lift the blind to allow light in the room. The integrated dim-out and sheer panel design provides easy light and privacy control in one compact roller design system. These soft shades are constructed using large fabric vanes and a full length of sheer fabric. Their unique, fold-up design creates clean lines in any room, looking just as stunning folded up as they do fully down. The modern in-built cassette ensures that the blinds have a clean appearance when rolled up and that you get a clean view of the outside world. When the vanes are rotated the panels are designed to fold neatly, creating a luxurious feel. Not only do these blinds look great, but they are also designed to filter strong sunlight through the sheer fabric. By reducing the amount of harsh UV light that enters the room, this will protect your furniture from fading or becoming discoloured. Ares Blinds are available in five classic dim-out colours, plus a bright and airy light filtering fabric option. The subtle complimentary colour variation in the fabric weave gives great scope for colour matching, which will compliment any interior. Appearances aside, when it comes to durability, Ares Blinds will stand the test of time as all ABC Blinds purchases come with a 2-year warranty. If you are looking for a quick and easy way to make the interior of your home a little more elegant, you should consider installing Perth made and manufactured Ares Blinds. 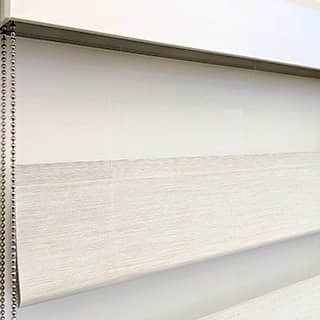 If you like the elegant appearance of Roman Blinds, but want a more contemporary window dressing, Ares Blinds may be the perfect solution for your home or office. 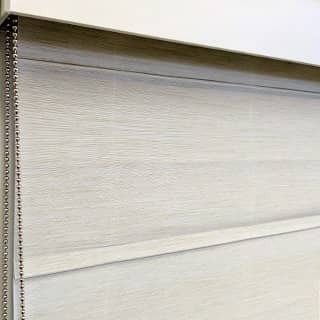 Interested in Ares Blinds? These blinds are available with ABC’s intelligent home motorisation system: SmartHome. This innovative device connects to your home WiFi, allowing you complete control of your window treatments using just your voice or your smartphone.